With the passage of the Affordable Care Act and MACRA, the transition to value-based reimbursement is underway. As such, hospitals and health systems will need to consider various alignment options, such as whether or not to enter into employment agreements with physicians or physician practices. Unfortunately, such employment arrangements typically result in the hospital or health system incurring substantial and continuing losses. 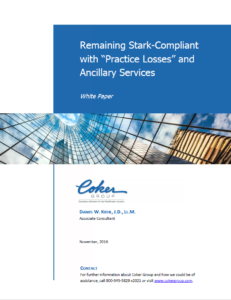 This White Paper will examine the reasons for and dangers these losses present, as well as discuss strategies for mitigating losses.